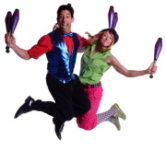 This dynamic juggling/acrobatic duo has performed their amazing and odd skills (like synchronized flowerpot manipulation) around the world. Jack Kalvan is a comedy juggler and former mechanical engineer. His wife, Jeri, is an acrobat and stuntwoman. Living in Los Angeles, they both have numerous film and TV credits including: “Spider-Man 1 & 2”, “Alice in Wonderland”, “Water for Elephants”, “Buffy the Vampire Slayer”, “The Tonight Show”, “The Ellen Degeneres Show”, “CSI”, “NCIS”, “Days of our Lives”, and many more. We’re excited to have them back at the Moisture Festival.